I received an electronic galley of this book via NetGalley. I am known for my passion for artisan cheese. For me, it’s a Pokemon-like gotta-catch’em-all joyful hunt. However, I’ve never tried making cheese, even though I’m a baker and I love experimenting with diverse recipes in the kitchen. What little I had read about home cheese-making left me very intimidated. That attitude has shifted after reading this book. 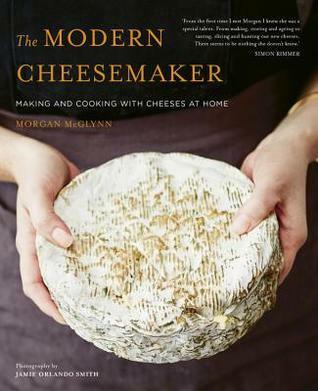 Morgan McGlynn is a cheese-monger and cheese-maker in the UK, and she has written a book in which I feel like she gently took me by the hand and showed me step by step how to make my own cheese. The book is organized by level of difficulty, too–start with fresh cheeses like mozzarella and ricotta, and work up to hard cheeses (hard in texture, harder and more time-consuming to make) like aged Cheddar and Brie. This isn’t simply a recipe book, though it does indeed feature recipes for 18 cheeses plus some 40 recipes for utilizing that cheese. This is a book about the basics: the science of cheese explained in straightforward terms, a breakdown of the equipment needed to safely and successfully make cheese, and also information about professional cheese-makers along with a list of some of the best cheeses in the world to seek out. To make this all even better, there are abundant full-color photographs that illustrate the steps and show what the finished results should look like. Oh, and I should add that all of the information is presented in measurements friendly for readers/cooks in Britain, America, and elsewhere. The recommended places to buy supplies are also not focused on one specific locale. McGlynn wants to help you make cheese, no matter where you live. I think I’m going to get a large pot and a few other new additions for my kitchen and finally give homemade cheese a go. The idea does still intimidate me, but now I feel like I have a guide to help me on my way.